I have a good reason for taking a two-week hiatus off Katieshack: I was in Arizona, walking five holes of golf with Jack Nicklaus. in Marana, the new 27-hole Nicklaus complex that opened only five weeks before this year’s Accenture Match Play Championship in February. Yes, it was the course that all the players whined about being too difficult, and all the broadcasters gave their two cents about. Hey, here’s a novel idea fellas: play a practice round. Champion Geoff Ogilvy did, and he won the championship for the second time in four years. Go figure. More on that later though. The course is spectacular. It’s stunning to look at and, for people who watched the event on television, shows beautifully on the screen. Massive Saguaro cacti, jumping chollas (AKA scary little cacti pieces) and mountain vistas are everywhere. The course is so new that fairways are pure emerald and the greens barely show signs that people have played the course. It is not an easy layout by any stretch, but it is a great test of desert golf by anyone’s standards. I was part of a small media group from all over the country, including a writer from worldgolf.com, Golf Magazine, About.com and a travel golf writer from Germany. 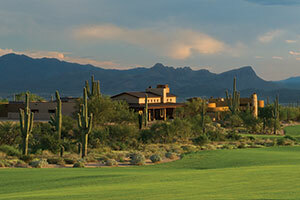 The trip was sponsored by the Ritz-Carlton Resort, to open in the fall (see the November/December issue of FORE Magazine for more information) as well as the Tucson Convention and Visitor’s Bureau. On Thursday our group was lucky enough to play the Tortolita/Wild Burro nines of the course (the PGA Tour played the Saguaro-Tortolita nines for their championship), in preparation for Mr. Nicklaus’ press conference and visit to the facility the next day. I hit my first drive into a Saguaro cactus and stopped keeping score after seven holes, but had a good time playing with an editor from Golf Magazine. Our caddie, Kevin, was one the best green readers in the Southwest; too bad my putting kept getting in the way. while he didn’t utter any swear words while out there, there was a great deal of sarcasm on his part regarding the PGA Tour’s request to change aspects of his course to cater to the Tour’s players. Designing a golf course is a very personal, emotional investment, and it was evident in the way he discussed the experience that he put a lot into this PGA Tour and private member golf course, a delicate line to balance. It was one of the most real, down-to-earth and refreshing looks at golf that I’ve heard in a long time, from the Golden Bear himself. Afterward, we went to the tournament course’s 14th hole, where, to everyone’s surprise, Mr. Nicklaus and his son, Jackie, said they would actually play the last five holes for us. After a beautiful dedication ceremony complete with the release of 10 doves, as well as Native American dancing and music, Mr. Nicklaus and his son proceeded to put on a memorable exhibition of golf and business. His commentary was especially intriguing to listen to in regards to what the Tour mandated that he change to the course; he was wearing a microphone the entire time. Never did I think, though, that I’d be walking down the 18th fairway, look behind me, and see Mr. Nicklaus literally 2 feet behind me, brushing by me on his way up to the green. I could go on and on, but I’ll wait until the November issue of FORE to indulge you with more. Until then, if you find yourself in Marana, get a tee time at Dove Mountain and walk in the footsteps of legends and professionals. It makes for a great memory, no matter how you end up playing.